• We believe strongly that the Code of Conduct is a superior document to the IHRA, and that the Labour Party NEC should defend it. • The seemingly compelling claim that the IHRA text is “the internationally accepted definition of antisemitism” is simply not true. • The elements of the Jewish community in this country that have pushed most strongly for the Labour Party to adopt this document neither represent or speak for most Jews. Their leaderships are primarily conservatives and/or supporters of the most right-wing Israeli government in its history. The UK Labour Party should not – and does not need to – take its cue from its political enemies. 1. We believe strongly that the Code of Conduct is a superior document to the IHRA, and Labour Party NEC should defend it. • The claim that the Code of Conduct reduces protections for Jews afforded by the IHRA document is false. As the NEC asserted when it was adopted, the Code of Conduct reinforces and strengthens the protections by making clear the distinction between antisemitism and anti-Zionism. A significant proportion of Jews in general, and a higher proportion of Jews in the Labour Party, describe themselves as non- or anti-Zionist. It writes out, excludes and silences the majority of Jews who are critical of Israel. Every reliable survey of Jews in Britain shows a majority are opposed to the occupation. In some of the few countries that have signed up to the entire IHRA document (see below), there is rising antisemitism, often perpetrated and incited by the very governments that have adopted it. Clearly, the IHRA Working Definition is not protecting Jews, or Muslims, Roma or any other communities that are the targets of racism. On the contrary, it is acting as a cover for antisemitic states. By tying the defence of Israel and Zionism to Holocaust remembrance, the contentious IHRA examples will generate cynicism about the Holocaust and about real antisemitism amongst people campaigning in good faith for justice for the Palestinians. This is already happening in the form of claims that all the accusations of antisemitism are “just a smear”. 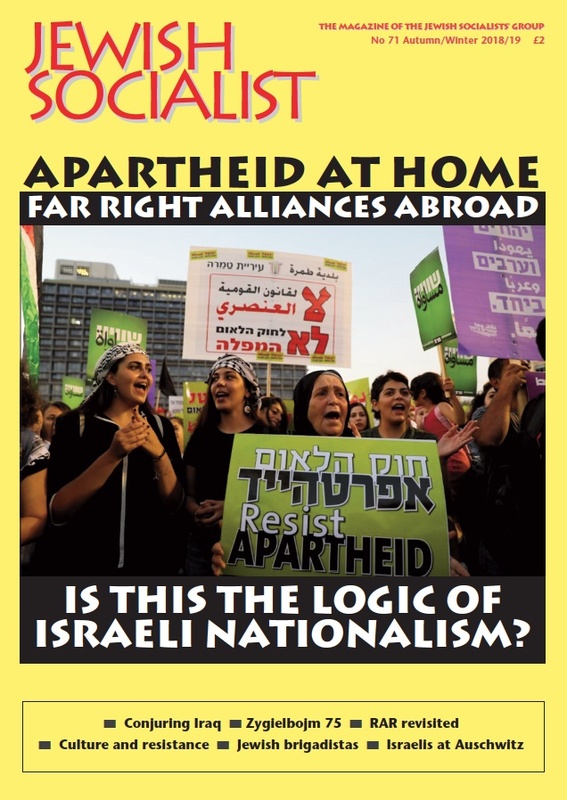 The Jewish Socialists’ Group, which has been fighting racism and antisemitism since the 1970s, whether it emanates from the left or the right, is highly aware of the dangers of such cynicism. • The Code+ alternative to the NEC-agreed Code of Conduct resolves none of the problems. The caveats to the IHRA text proposed by the Home Affairs Select Committee refer only to the Israeli government, rather than the Israeli state. If this became Labour Party policy, it would define anyone criticising the state as antisemites, and would similarly label all Palestinians, who have good reason to criticise the state and not just its government. Most human rights campaigners, and anyone challenging Israel’s new Nation-State Law, which establishes state apartheid and discrimination against Palestinians and all other non-Jews, would either be silenced or would fall foul of the IHRA rules. • The Jewish Chronicle editor who has vociferously promoted the entire IHRA document, has said that if the Labour Party accepted the IHRA examples it would have to expel hundreds if not thousands of Labour Party and momentum members. 2. The apparently compelling claim that the IHRA document is “the internationally accepted definition of antisemitism” is completely untrue. • Only six of the 31 IHRA member countries have adopted and endorsed the IHRA definition (whether or not in its entirety is not clear). • Of those six, one is Austria, whose antisemitic government is harking back to its Nazi past by threatening to force Jews to register their names in order to obtain kosher meat. Another of the six signatories is Israel, which has just officially established apartheid and discrimination against the Palestinians and all other non-Jews by enacting the Nation-State Law. A third signatory is Lithuania, where the authorities promote and endorse the commemoration of Nazi collaborators. • The JSG would like the Labour Party to ask two questions of those promoting this move. 1. Why have 25 of the 31 IHRA member countries not signed up to it. 2. Why would those promoting the IHRA document do so on the basis of such a major false claim? 3. The elements of the Jewish community in this country that have pushed most strongly for the Labour Party to adopt this document do not represent or speak for most Jews. • Adopting the full IHRA text will undermine hard fought gains by progressive Jews within our own community to have a voice, to be free to speak out in support of justice for Palestine, to criticise Israel, to dissent from the supposed leadership, to be protected as an ethnic minority, and to be informed about our own situation as Jews. • The Board of Deputies (BoD) has a partial democratic mandate, and represents a slice of the community. Some of its constituent synagogues discriminate against women in the election of their delegates and representatives. Many Jews are unrepresented (and misrepresented) because they are not members of mainstream religious, Zionist or other community institutions. As a result, they do not appear in statistics or research about Jews and Jewish life. The BoD today, as throughout most of its history, represents the most conservative and conformist positions within the Jewish community. • The Jewish Leadership Council has no democratic or any other mandate to represent anyone but itself. It was established by a group of business people who were close to and met regularly with the then Prime Minister Tony Blair and the Israel lobby organisation BICOM. • The leaders of these supposedly representative organisations are primarily supporters of the Conservative Party, the New Labour project, and/or supporters of the most right-wing Israeli government in its history. • We do not believe that the NEC needs to or should take its cue from people who actively oppose our Party, who endlessly try to undermine us, and who have repeatedly made extremely defamatory comments about Jeremy Corbyn. • The Chief Rabbi is not elected; he is appointed from one group of synagogues out of a constellation of many. Although his role is supposed to be non-partisan, the current Chief Rabbi is very close to Theresa May and has written carefully timed articles to undermine votes for Labour. • The current President of the BoD has recently claimed that Jeremy Corbyn has waged war on the Jews, and the Jewish Chronicle editor has claimed that a Jeremy Corbyn-led Labour Party is an existential threat to Jewish life, and has said: “Had the full IHRA definition with examples relating to Israel been approved, hundreds, if not thousands, of Labour and Momentum members would need to be expelled.” The JSG does not believe it is possible to have a constructive discussion with such bodies. • Our self-proclaimed representatives, both within and outside the Labour Party have scuppered and misused all attempts made by the Party in good faith to consult with them. • The institutions that claim to represent British Jews have a poor and selective record of challenging racism and fascism, both historically and currently. As such, they have failed the community by distancing it from other minorities facing the similar challenges and with whom we need to act in mutual support and solidarity. • We don’t recall a single word of criticism by the BoD against the occupation, the illegal settlements in Palestine or the discrimination against Palestinians and other non-Jews within Israel, despite Israel’s breaches of international law, and the fact that most British Jews oppose the occupation and the accelerating settlement of Palestinian land. • defend the Code of Conduct, which was rigorously drawn up to tackle antisemitism effectively and would stand up in court. • make very clear and detailed commitments to support Palestinian rights. • build constructive relationships with Jews with whom it has common ground. This might mean a number of one-to-one or small group meetings. • facilitate and encourage wide ranging discussion that is neither led nor limited by the agendas of official organisations or institutions. • work with a range of minorities, including Jews, to develop common responses to the rise of the far right and all forms of racism. There are many progressive Jewish individuals and groups that could find common ground with the Labour Party in order to have fruitful discussions about issues that concern all of us, from the desperate need to fight for justice for the Palestinians, and the frightening rise of the racist far right across the world, and particularly in Europe. Since 2000 there has been a flowering of the left and progressive elements in the Jewish community. This includes groups like Jews for Justice for Palestinians, Independent Jewish Voices, jewdas, Jewish Voice for Labour, Na’amod (young Jews supporting Palestinian human rights) and many more, alongside an older generation of groups such as the Jewish Socialists’ Group and the Jewish Council for Racial Equality. Our fear is that rather than helping the Labour Party challenge antisemitism, adopting the IHRA text in its entirety, with all the contentious examples, would leave us less able either to deal with antisemitism and other forms of racism in our own Party, or to unite, in good faith and in solidarity with other targeted communities, to challenge the frightening rise in numbers and confidence of activists on the far right. The Jewish Socialists’ Group was established in 1974 by working class Jews in Manchester and Liverpool who had a history of fighting poverty and antisemitism going back to the 1930s. Throughout our existence, we have played a very significant role in Holocaust education for both Jews and non-Jews. Every year we hold a commemoration of the Warsaw Ghetto Uprising. Our members have been central to the huge and influential events on the 75th and 80th anniversaries of the 1936 Battle of Cable Street, in which Jeremy Corbyn has participated. A member of the JSG is one of the group leaders of an annual educational trip to Auschwitz organised by Unite Against Fascism, which explores antisemitism past and present. The Jewish Socialists’ Group is not Zionist; we do not see Jewish self-determination as predicated on a territorial nation state but are committed to the continuity of Jewish life in the diaspora. This means that we are committed to the future of Jews living alongside and in solidarity with other minorities, working for justice, equality and an end to discrimination for everyone, wherever we live in the world. Zionism has always been a contested position in Jewish life. From its inception in the late 19th century, political Zionism was a minority position and remained controversial even after the establishment of the State of Israel. The Lebanon War and the Sabra and Shatila massacre in the early 1980s raised profound questions for many Jewish people, undermining their relationship with and support for Israel. The six IHRA member countries that have adopted and endorsed the IHRA text are: the UK, Israel, Austria, Romania, Germany and Lithuania. Two further countries have adopted and endorsed it but they are not members of the IHRA. One, Bulgaria, is a liaison country, the other, the Former Yugoslav Republic of Macedonia, has observer status. Most recently the Jewish Labour Movement has demanded that the Party agree to their demands before having a “consultation” meeting with them. Prior to that, the JC editor acted to sabotage a meeting with Jewish institutional bodies at the Jewish Museum. These are just two examples of many. In1936 the BoD told Jews to stay at home and not fight Mosley (Cable Street); in 1977-8 the BoD ran a campaign to dissuade Jews from joining the ANL; in the 1980s the BoD concealed statistics of far right antisemitic incidents, preferring to focus on incidents that were connected to the Palestinians; in 2018, the BoD will not support the demand for investigation into racism in the conservative party, including antisemitism and Islamophobia.